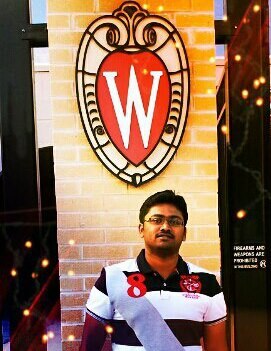 I am a first year graduate student in the Department of Computer Sciences at University of Wisconsin Madison. I completed my B.E. in Computer Science and Engineering from College of Engineering Guindy, Anna University Chennai. Helped in the developement of Entity recognition Module and Knowledge Graph generation module. Helped in Mining the entire wikipedia web corpus and establishing implicit and explicit semantic relationships between mined entities using in-link, out-link and cyclic links between them. Helped in the construction of user profile from the user search logs and developed an analysis tool for demonstrating search enhancement procedures based on user activity in PDA devices. Helped in the development and maintenance of Language Model based Keywords Extraction Module. Developed Modules for merging of Smarttag Entities mined from various data sources as Wikipedia, IMDb, LastFM. Helped in the developement of actionables data generation module, which associates relevant actionable features with each smarttag based on its type. Designed a new routing algorithm for Spidergon Network on Chip (NoC) with load balancing and fault tolerance and compared the performance with all existing architecture and routing algorithm. Simulated an ancient castle with special effect Rendering, Point Source Illumination, Animated Smoke Emission and 3D camera covering the entire arena using OpenGL. Implemented a multicast routing protocol that uses the underlying unicast routing information base and builds unidirectional shared trees rooted at a rendezvous point per group. Includes profile management of users under different categories, recommendations based on user activities and category and development of a forum and messenger for the users. Developed an application that allows concurrent access to the admission system. The GUI was developed using the graphics functionality in C.
Simulated a self-controlled traffic monitoring system which controls traffic based on traffic density around the hot spots using 8051 microcontrollers.